Słownik Japońskiej Gramatyki 3 będzie wspaniałą pomocą dla osób pragnących dobrze poznać język japoński. Wystarczy, że otworzysz słownik na interesującym Cię zagadnieniu a znajdziesz tłumaczenie i wiele przykładów użycia danego zagadnienia w kontekście. Zawiera wiele przykładów i zrozumiałe wyjaśnienia w języku angielskim. 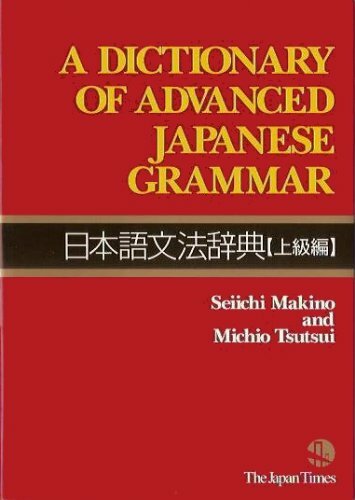 A Dictionary of Advanced Japanese Grammar. help them deepen their understanding of the critical and subtle differences in meaning and usage between the target expressions and other synonymous expressions. Following the same format as the previously published volumes, A Dictionary of Basic Japanese Grammar and A Dictionary of Intermediate Japanese Grammar, the book offers approximately 230 Japanese grammar items that are believed to be highly important for students striving to master advanced-level Japanese and also for instructors who teach Japanese at that level. This book is especially useful when reading advanced-level materials such as newspapers, professional journals, technical/business/legal documents, academic papers, and literature. and number marking in Japanese. The English Index enables students to look up the book’s main entries using English. The Japanese Index is comprehensive; it includes all the main entries and related expressions that appear in this book and the previous dictionaries.